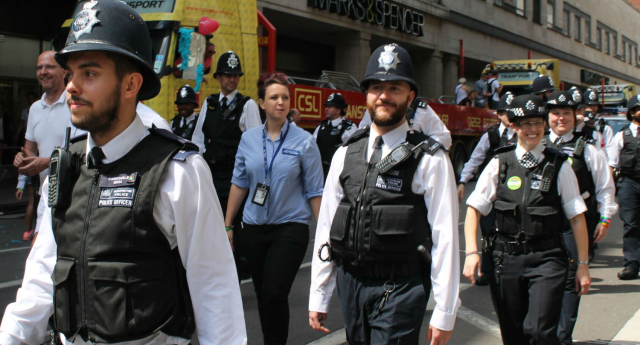 Reports of homophobic crimes have surged by nearly a third in London in the past year, according to data from the Metropolitan police. The data comes from the force’s latest annual crime figures – which allow types of reports to be broken down by borough and by crime type. It shows that 1,667 homophobic offences took place in the 12 months to July 2015 – up from 1,289 in the 12 months to July 2014. The shocking data – an increase of 29.3% year-on-year – may be partly down to better recording of hate crimes, though it does signify a worrying trend. Racist, anti-Semitic and Islamophobic attacks all also saw a rise – though the number of homophobic incidents recorded was nearly double those of Islamophobic crimes, and three times the number of anti-Semitic crimes. Three homophobic crimes were recorded in Heathrow Airport – which is recorded separately in the data. It comes after a PinkNews YouGov poll found that compared to the rest of the UK, Londoners are over five times more likely to reject a gay or trans child. 13% of Londoners indicated they would not support their child if they were gay, while 20% indicated they would not support a trans child.